In high school, my friends and I would have “bonfires” at one another’s homes in an enclosed fire pit. I remember those evenings, circled up in random lawn chairs and benches, sitting and talking the nights away. That’s when I learned that Old Navy flip flops will melt if you rest them on the edge of the fire pit. Lesson learned. I’m glad I’m older and wiser now. My favorite bonfire (actual bonfire) was the during the Fall of my senior year in college. We were in the cornfields of Indiana and there were LOGS in our bonfire! It was nice to be surrounded by peers, not running the risk of bothering anyone, and enjoying the ambience of the evening. Fast forward to a month ago. My cousins came over for s’mores and sangria and I had a fire pit. However, this girl did not earn her girl scout badges through knowing how to build a campfire. I got my camping badge through staying at the Raddison (my mom was my troop leader, I have no idea how she pulled that off). That being said, my campsite (i.e. : fire building) skills leave something to be desired. It took over twenty matches, one burned finger tip, two whole paper bags torn up for “kindling,” and an awful lot of rearranging of the wood before we got it to stay lit. However, the fire did what it was supposed to; it provided warmth on a chilly autumn night and made conversation flow as the flames danced in the crisp air. That’s what I like most about gathering around the fire pit/bonfire – it has the ability to bring people closer through its warmth, which somehow (seemingly magically ) fosters the best conversation. 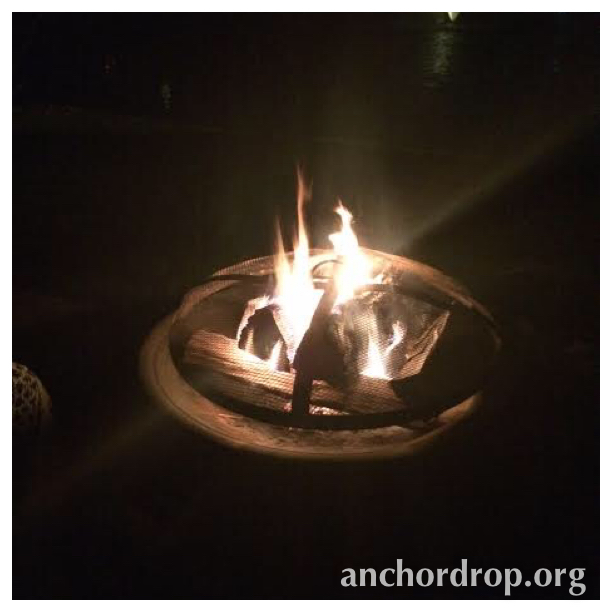 I’ve found that laughter and a myriad of topics arise out of gatherings around the fire. Why don’t I do this more? Do you have a favorite “fireside” story or memory? If so, do share!